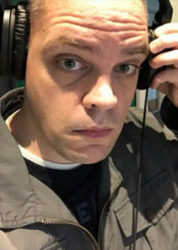 Broadcast Dialogue is reporting today that ten year station veteran John Ackerman (pictured) has been upped to morning co-anchor on News 1130 Vancouver. He succeeds longtime anchor Reaon Ford, who was part of a handful of layoffs in the newsroom in June. Sonia Aslam also moves into the midday editor role, vacated last month by Dave White who has joined CBC Radio Calgary. PS .. John Ackerman’s radio itinerary is supplied by Vancouver Broadcasters. BCIT Broadcast Journalism graduate 2005; programmer CJSF Burnaby 2000/2003; researcher The Rafe Mair ShowCKBD Vancouver 2004; reporter/producer/anchor CKWX Vancouver 2004-07; reporter/producer CHEK-TV Victoria 2007-08; morning news CKCL-FM/CFUN-FM Vancouver 2008-10; producer/writer CKVU-TV Vancouver 2008-11; CKWX anchor/reporter 2008-13, midday anchor 2013-17 & Weekend Managing Editor 2017-current. A co-worker who was always pleasant to work with I am sure he will have no problem earning his place in number one slot. Best wishes to John and Sonya Aslam who was also a first class worker. All the best to both of you. TBH, I have been gravitating to 1130 when Steel starts to grate (almost every day) and Sekeres gets on his SJW horse and hectors us (every day). Started as more of a go-to place during above situations, now more of a first choice. Aside from AM730 when I really want to know about traffic. CKNDP (NW) always attracts a lot of attention when it comes up. Until Christy Clark became Premier J McComb was fair and balanced then he went 100% SJW Progressive against anything Free Enterprise, something about Christy he hated. I have given up on McComb since he had “Political RE-Assignment Surgery”, never could really handle Simi and her pathetically weak attempt to come across as balanced. She is anything but. Even Addler who at one time seemed fairly balanced has succumbed to The SJW Elixr. Trump seems to have that effect on people. They will need to learn the hard way. I find it very interesting that I make a concerted effort to listen to Bruce, Campbell, Palmer, Smyth, Roy Green, and Jill Bennett if I can. Would really like to see WX hire Michael Smyth to do 8:3o AM to 12:00PM then News to 1:00 PM then JB from 1:00 PM to 4:00 PM with World, National, B.C. News for Drive Time. I believe WX could overtake NW in a matter of weeks. But then what do I know, I am not a Highly Talented PD like the Mensa Member that runs NW. I am very hopeful for NW as I do enjoy Radio when out in the car and sometimes at my desk. Good Luck to both Assam and Ackerman I am sure WX will only get better. It is a tough business and who knows how moves like these work out until the Bread is Baked. NW is still doing pretty good overall considering the abysmal lineup they have. I can’t believe McComb is still around and assume his leanings are a matter of KYJ with the SJW American boss, Ditto for Adler, Sara should stick to meatball recipes and the woman in the afternoon is pretty well filler. Drex is now hit and miss many times looking for sensational stories from the trailer park set, but then again he is fine in his slot where people are either sleeping, drinking or trying to get to sleep. I have to agree with BCMQ , we truly need fair unbiased hold everybody accountable journalism , I love how mike smith ask every one the hard questions , while making fair comment. Hearing Simi talking to Vaughan Palmer about wearing shorts to the leg during a spot on politics made me sick . I must admit I make an effort to catch Palmer, Smyth, when on NW each morning when McComb is on or Sara subbing but then tune out. I was a very loyal McComb Listener. Sara weakly attempts to be balanced but the listener would need to be very dense not to figure out she has an extreme bias against Anything Conservative. I find the Anti DJT Rhetoric at NW to be as deranged as the out of control the Sky is Falling Madness at CNN (Clinton News Network). Yes Trump can be Boorish, Rude, Inarticulate, Confrontstional, and even Orange but the Great Unwashed were/are fed up with the Rabbit Hole Obama, Merkel, Hollande, Junker, and other EU Leadership took the Free World and they rejected u more years of Obama Elite PC Liberalism under Hillary. Media People will not accept that and they are still Fighting the War. I strongly believe that if Trump could cut back a little bit on some of his Unfiltered Twitter Rants he would already have Beaten Acosta, Tapper, Anderson, Lemon, Morning Joe, and the rest into Submission. If he could only temper some of his commentary he could improve things for the Republican Party by several percent in the Mid-Terms. Contrary to wishful thinking by CNN I believe the Republicans will be successful but they could do even better if DJT did not pick fights with people like LeBron, he should simply ignore comments from Most Celebs who are not well informed and listen only to CNN Talking Points. “Don’t Confuse Me With the Facts, I Have Already Made Up My Mind” ! I believe we all want balance and as a Fed Con and B.C. Liberal Supporter i do not mind criticism of those Parties as long as it is warranted, i also am fine with credit to NDP if they do something worthwhile as long as the comments are not unfair. CKNDP (NW) PD seems to have created an anti Free Enterprise/Conservative Agenda Based Bias and Narrative against Conservatism. Based On what? I like the idea of hearing both sides which allows an informed listening audience to make decisions based on factual information. You make an Astute Point when you point out the ability and fairness of Michael Smyth to ask Tough Questions of Politicians from ANY Party. Isn’t that the way it is supposed to be? Isn’t the Listener deserving of that? NW balanced and entertaining shows. Jill Bennett on Sat and Sunday. Any show that Jill Bennett or Mike Smyth guest host. You forgot Campbell & Allen…two self made guys who don’t cowtow to anyone, who can call out anyone, with intelligent takes. Great move for news1130 ! Having said all that Micheal Campbell has done the math. The UNFUNDED public sector liabilities are aprox $$$$$$$ 25,000.00 to each and every Canadian. Think about that number everytime Horgan creates a new ministry. Every time Trudeau opens the boarders a little wider. When Doug Ford says he is going to eliminate 50% of the Toronto municipal councilors we should applaud this action from sea to shining sea. With toads like JT & JH in control, smart business people really have to be nimble as to what changes they likely will face over the terms of these various governments. Non union contractors now face being shut out of government-funded work in BC. A friend in that industry recently leased 21,000 sq.ft. in Mississauga Ontario, and is hiring up to 37 tradespeople. They have a hiring freeze for BC projects. Driving force for his decision…Doug Ford.